Dito pelo Maldito – Você viajaria para um sítio afastado, com quatro especialistas em crimes? Você iria para um sítio isolado, com quatro especialistas em crimes? 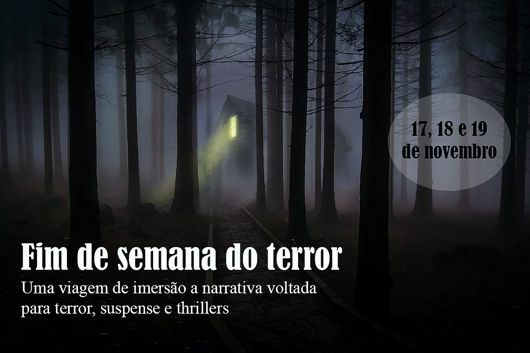 O Fim de semana do terror é exatamente isso: uma viagem de imersão as narrativas de terror e suspense com os autores Ilana Casoy, Raphael Montes e Santiago Nazarian, e a editora Mariana Rolier. Durante um fim de semana, eles falarão de suas experiências no mundo do terror da ficção e não ficção, darão dicas práticas para quem quer escrever narrativas desse gênero, mostrarão as várias opções de narrativas e, principalmente, ouvirão o que cada participante sente e pensa sobre seu próprio trabalho e experiência. Além disso, ao final da viagem, publicaremos um livro digital, com um conto de cada participante, inclusive com o dos convidados! Uma chance de ter seu conto publicado junto aos grandes nomes do terror nacional. O desafio está lançado. Quero ver ter coragem! Having read this I thought it was very enlightening. I appreciate you taking the time and effort to put this article together. I once again find myself spending way too much time both reading and commenting. But so what, it was still worthwhile! Thanks so much for giving everyone such a nice opportunity to read articles and blog posts from this site. It’s always very great and full of a good time for me and my office mates to search your website on the least three times in a week to find out the new issues you will have. And definitely, I am just always pleased considering the breathtaking knowledge you serve. Certain 2 areas in this posting are in reality the most effective I’ve had. I am really inspired along with your writing talents as smartly as with the structure to your blog. it yourself? Either way keep up the excellent high quality writing, it’s rare to peer a great blog like this one nowadays..
My husband and i felt really fulfilled when Edward managed to conclude his basic research via the ideas he gained out of the web page. It is now and again perplexing just to possibly be giving away tips and hints which usually other people might have been making money from. We really know we now have the writer to appreciate because of that. The specific explanations you’ve made, the simple site navigation, the relationships your site give support to instill – it’s many astounding, and it’s really leading our son and the family recognize that this matter is satisfying, which is truly fundamental. Thanks for all the pieces! I am also writing to let you be aware of of the remarkable experience our princess enjoyed viewing your web site. She came to find some issues, which included how it is like to have an ideal coaching spirit to let folks easily learn certain tricky topics. You actually exceeded her expected results. Thank you for presenting those warm and friendly, dependable, revealing and also fun tips about the topic to Julie.